Dress-historian, portrait specialist and photo detective Jayne Shrimpton is on hand to date your family photos. I saw your recent analysis of a family photo and it reminded me of this lovely picture that I sadly cannot identify. It was taken by HP Robinson & NK Cherrill, photographers at Tunbridge Wells, but so far I've not come across any ancestors living in that area. On the reverse is printed all the medals won by the photographers, with the latest date being 1881, yet I feel this photo has to be older and might be a copy of an earlier picture. The photo has been pushed into an Edwardian oval frame so the subjects must have been close family and my best guess would be Great-grandmother Emily Triggs (1849-1947), with either her sister Louisa, or her mother Jane Connolly (1819-1896). I'm very fond of this photo and would love to know exactly who the ladies are. Any help would be much appreciated. Clearly this is a professional studio portrait, but without seeing the photographic card mount, I only have the visual image to work from. Unusually, the picture is completely blank, except for the two figures posed in a close-up three-quarter length composition: there is no painted backcloth, no studio props or other pictorial clues, the main focus of the scene being the two young ladies. Fortunately, however, female fashions changed distinctly in the past and with regularity, so the appearance of your ancestors can be firmly dated from the details of their dress: the style of their garments, their hairstyles and their accessories – all the components of a complete ensemble. Periodically a photograph is submitted that is essentially a beautiful fashion shot and this is a good example featuring fine dress details. 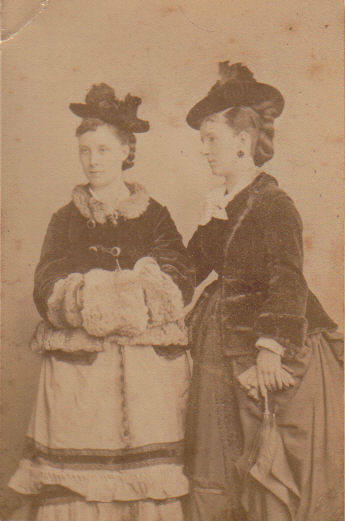 Attired purposely for their special photograph in stylish outdoor clothing and judging from the warm velvet material, leather gloves and umbrella (right) and fur garment trimmings and muff (left), these modish young ladies posed for their photograph in late-autumn or during the winter season. The style and form of their garments, the shape of their hats and their ornate coiffures express vividly the extravagant fashions favoured during the mid-Victorian era, confirming the date of this photograph to be c.1870-75. By 1870, a high-waistline had evolved and dresses were layered and draped up over a bustle projection at the back of the skirt, producing the short-bodied, soft, curvaceous silhouette characteristic of the early-1870s, as seen here. The bustle (or tournure – the polite, French term) was a pad tied behind the waist beneath the clothes and this remained in vogue until at least 1874/5, defining the fashionable line. For outdoors, full-length coats were unsuited to the bustle dress, and a short, fitted jacket-bodice like the velvet garments worn here became popular. The Young Ladies Journal, 1st October 1870 declared: ‘Jacket-bodices are decidedly fashionable this autumn.’ Another notable feature by 1869/70 was the complex dressing of the hair into a full chignon: thick plaited sections like those modelled in your photograph were very fashionable and often necessitated the use of artificial tresses, to augment the natural hair – a trend still noted in the later 1870s. Neat tilted hats perched atop the head, so as not to disturb the coiffure: styles varied but quasi-historical shapes such as the velvet ‘Rubens’ hat with upturned brim worn on the right were much admired. Just like today, young Victorian women enjoyed following fashion and, in general, photographic evidence supports the notion that before they were married and gained family responsibilities, even young working-class women emulated the latest modes, as far as their finances permitted. These two ladies may be of middling class, but either way are clearly youthful and appear to be unmarried. They may well represent sisters, or possibly cousins, and you suggested that they may be your great-grandmother Emily Triggs (1849-1947), photographed with her sister, Louisa: this seems a sound hypothesis and we might even speculate whether Emily was perhaps photographed in 1870 to mark her milestone 21st birthday. Finally, going by your description of the studio named on your card mount, it seems that this lovely photograph was taken by the well-known photographer, Henry Peach Robinson, who worked in partnership with Nelson King Cherrill c.1867-75. You will find much about this business online, but here is a reputable website covering Robinson’s work: http://earlyphotographers.blogspot.co.uk/2010/08/henry-peach-robinson.html . Without seeing your card mount I cannot comment constructively on your mention of a medal dated 1881: this seems anachronistic in terms of both the photographic image and the studio dates and may be an error; I doubt that this photograph is a later copy. Assuming that it is the original, it is interesting to consider what your ancestor was doing in Tunbridge Wells as a young woman: perhaps she was enjoying a weekend visit or short holiday in the fashionable spa town and had a souvenir photograph taken to commemorate her stay. If you have any 18th, 19th or 20th century pictures, and are happy for Genes Reunited to share the image and findings, please scan and send a copy to theteam@genesreunited.co.uk with PHOTO in the subject. Images used will be selected at random. Please scan the front and back of card-mounted photographs. Could we ask that you do not any original images in the post.